Discussion in 'Repros' started by zhz44, Feb 28, 2017. Thanks for point this out. Not many people noticed this leather thing. I agree Vic. the few original 33 Werbers I have seen had a relatively smooth hide and Eastman replicate it very well. The knits are correct on the 33 Werber as John replicated the original size 36 use to pattern from. Thank you for confirming this, Andrew. This is the first time I know the knit has the different width. That original Werber, no, Joho outbid me on that one. Maybe I should glad about this. based on pics, it goes both ways. I have seen grainy pre-war A-2's. Do you have any pictures of original 33 Werbers with lots of grain John? not immediate/off-hand. I was referring to pre-war A-2's in general. Thanks John. Perhaps you can post a few pictures at some stage. as written earlier, "for the most part, MOST early, and pre war a-2s were made with smoother hh". yes, of course there are examples of pre war, and early war a-2s with grainy hides, however, they are the exception. i had a 1940 aero that was pretty grainy, as well as an original 1941 1401 rw that was quite grainy. 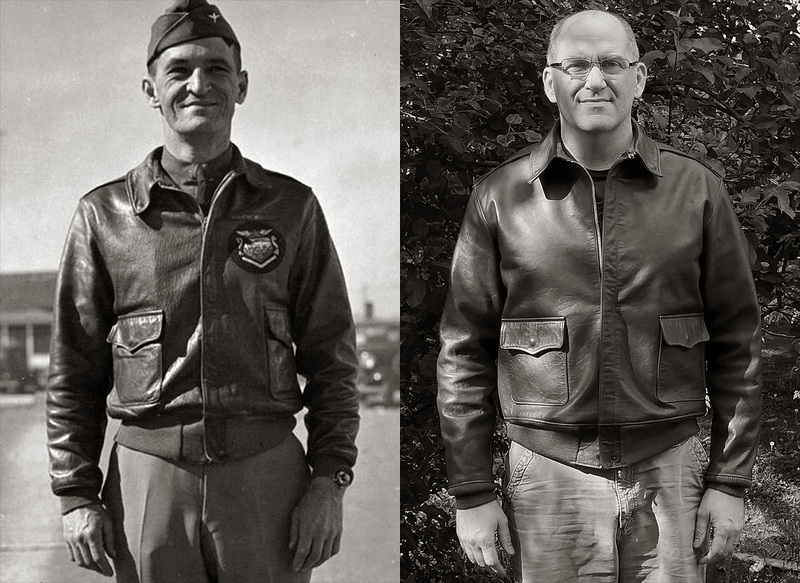 to my eyes, some contractors took pride in the jackets they produced, and sourced the highest quality materials they could find, while other contractors simply cranked out as many a-2s as they could, and paid little attention to quality hides above what was required to pass inspection. as exampled by monarch or rough wear vs spiewak or aero. Thanks Vic. I used to own two 1940 Aeros made from smooth hh. My first contract RW is made from largely smooth hh. 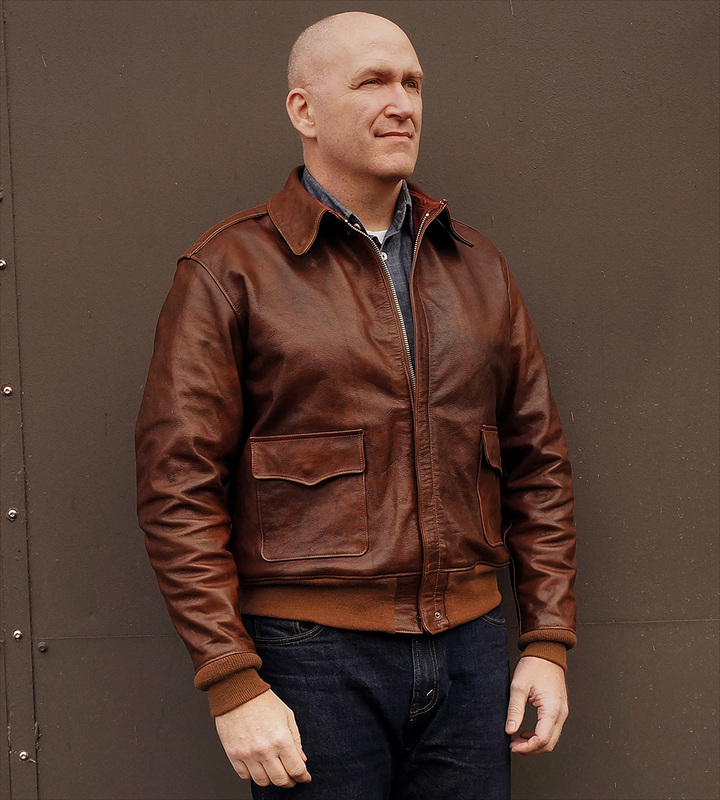 Most of the Pre-War jackets in Gary Eastman's book appear to be made from smooth leather. I recently picked up this Werber 1933 contract from John and its become my all time favorite. Between the leather, fit, hardware, and vintage look, I'm just so impressed. When Chennault was part of Three Men on a Flying Trapeze he wore a 1933 Werber. It's a great period in aviation, and I enjoy having a representative bit of it. My thanks to John again for his remarkable work. Roughwear and bretron like this. Royce's A-2's is a lil too grainy for me. Re grain, although I need to look through them again I've got some 6 or so ref books that I'm sure many of you guys have too but I don't recall see hardly any A2's with such a distinct grain. I'd go as far as reckoning that poss as much as 90% of pics show quite smooth skinned jackets that you might associate with both steer/cow and horse hides that surely due to size of the animal alone makes for more suitable skin that say goat as used on USN jackets. God knows how many hours I've spent scanning my books over the years but I'm now going to check again what I've said!! Don't get me wrong I like the grainy jackets as borne by my GW Doniger and SFA (Norshor) A1. I think the length is spot on,would rather have that than be to short and just have to wear it unzipped all the time! For this grain thing, I would like to refer to JC's photo (hopefully this is OK with you JC). To me, I think this 33 Werber worn by Chennault appears to have lots grain on the left panel, am I right? Your Werber looks amazing man, if I were to have a choice between grain or smooth it'd be grain anyday. Bags of character and sets it apart from cheaper copies. Your reference shot above says it all. Out of interest I googled 'WW2 A-2 jacket' and the results of 30 or so images are about 50/50 on original shots. Here is an original made from fairly smooth hh, which very much like that found on the current ELC version. I have never seen pictures of an original with as much grain as the GW example discussed earlier, but that does not mean they were not sometimes made with grainy hh, but I have yet to see one. Below is a picture of the varied grain on the ELC version. All of the Werbers on this thread look great!!! Love the Air Corps Tactical School patch on Chennault. By today's retail standards his jacket looks WAAAAAY too small on him. HAAAAAAA!!!!! Good to see the comparison pics and I note CC's collar does seem large so much so it's has a roll to it similar to how vintage button down shirts look, poss as a result of wear/ageing. It's me or is CC's left pocket further from the front that the right one? Interesting too is how JC's shoulder seams sit what appears to be a good inch lower down the arm although the actual sleeves look pretty much identical! Ironically, my GW Doniger shoulder seams sit higher and is something personally I like. CC looks quite a small guy, was he?